US Laveyron's LF2 season may be over after forfeiting their game this weekend against Pau Lacq Orthez. The reason given for not playing the game was that the club did not have enough money to cover their transportation cost. Bearing in mind that their remaining games are on the road against Nice and Roche Vendée, it is interesting to see if they travel. Pau Lacq Orthez will be awarded the victory against US Laveyron. As a result they will remain in fifth place behind Léon Trégor although they will have the same number of points. However Pau have a big advantage over Leon Tregor in the race for a place in the LF2 Final 4 (F4) because of the inclusion of Etoile de Voiron and SO Armentières in the timetable. For round 24, Pau will be awarded two points for their non-match against SO Armentiéres, which can move them into 4th place alone if Léon Tregor lose to Reims. Due to the complicated rules applied in LF2, Cavigal Nice cannot officially celebrate the regular season title although COB Calais cannot catch them. Their title and promotion to LF2 can only be confirmed next week. Cavigal Nice made hard work of beating Léon Trégor (62-53) in a poor game. Léon Trégor had a poor shooting game with just 29% success. But it was their 23 turnovers that hurt them in the end. Cavigal Nice also struggled all through the match and were trailing by 6 points with seven minutes to play. Yet with five minutes to play they went in front for the first time (52-51) with a three-pointer by Alexandra Tchangoue. They then bulldozed their way to victory. Hopefully next weekend they will be able to celebrate their title in front of their home fans if their scheduled opponents US Laveyron make the journey. Angers needed their most experienced players Carine Brossais (17 points) and Julie Barennes (13 points and 9 rebounds) to be on top of their game as they held off COB Calais (69-62). 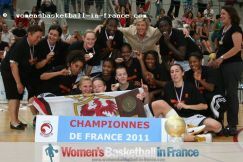 Floriane Herrscher and Kierra Millard had 22 and 18 points respectively for Calais. At the moment these two teams are likely to meet during the semi-final of the Final 4. Over the last decade the games between Illkirch-Graffenstaden (SIG) and Dunkerque Malo have been intense and interesting. This one was no different with Dunkerque having the best of the first half (39-35). The SIG turned on the turbo during the second half and overturned their guests for the victory (79-63). 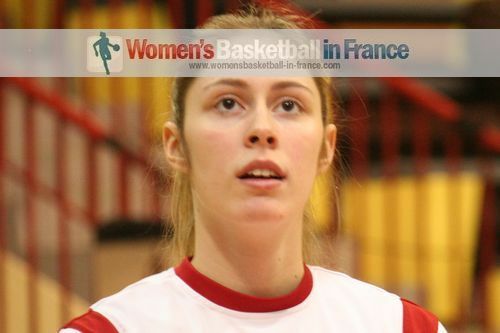 Aline Fischbach led the way with 20 points but the contributions of Louise Dambach (14 points), Awa Sissoko (14 points) and Amélie Voynet (in picture) with 11 points pushed them towards the victory. In the remaining games with nothing at stake Limoges played well but still ended up second best as they lost at home to Roche Vendée (57-75) while Reims BF stopped the CFBB from winning again (65-52).